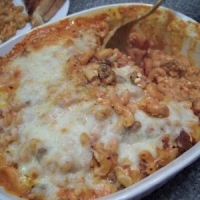 Pasta and hamburger baked in a creamy, cheesy, pizza sauce. Kids love it! Cook pasta, at the same time cook Ground Beef and drain fat. This is another one that sounds like a keeper…sorry got interrupted…the golden retriever and the shepherd both decided that I was ignoring them for too long. This sounds great and I'm going to make it tomorrow! Is there supposed to be pizza sauce in the recipe though? Like brooksdsh30's recipes? Never miss an upload!